Educators are hoping to integrate financial social work into all areas of social work practice, across the curriculum. Finances: They are an inescapable fact of life for every individual in today's society. Yet, they are rarely discussed openly and are more often ignored, if not dreaded. "It's almost a taboo topic," says Gabrielle D., MSW, a financial advisor in Michigan. That taboo combined with consistent developments in technology can lead to a separation between the individual and his/her finances, says Reeta Wolfsohn, CMSW, founder and president of the Center for Financial Social Work. "We are a culture that is very disconnected from our money. We don't see it. We don't touch it. We have credit cards, debit cards. We use our phones. We just don't interact with it in a way that keeps us focused and engaged. "It makes it so much easier to deny what's going on, to avoid what's going on, and at the same time, our unconscious knows, 'This isn't right; this isn't good.' It's a big problem," she says. Fortunately, financial social work is gaining traction in the field and coming to the forefront of practitioners' and educators' focus. Those leading the way recognize that not only do finances need to be discussed but they must also be addressed. An individual's, a family's, and even an organization's finances affect all other aspects of the unit. When they are in disrepair, it is extremely difficult to maintain stability elsewhere. For social workers to achieve efficacy in this realm, financial social work must begin in the social work classroom. But first, what exactly is financial social work? For one, it is a significant aspect of the foundation of social work. Margaret S. Sherraden, PhD, MA, Founder's Professor of Social Work at the University of Missouri, St. Louis and a research professor at Washington University in St. Louis, explains that the earliest social workers didn't hesitate to discuss and deal with finances. "This is not a new area for social workers," she says. "As Paul Stuart's work makes clear, when social work was a new profession, it was understood that part of social work included the financial management of the household, although it was framed in terms we wouldn't use today, such as 'thrift.' For several reasons, a focus on household financial well-being diminished through the mid-20th century, but increasingly came to the fore again as financial issues took on greater importance toward the end of the century." Paul Stuart, MSW, PhD, is a social worker who has researched, among other aspects of the field, the history of social welfare. Of course, financial social work wasn't termed financial social work in the early days and it looks a bit different now than it did then (Wolfsohn notes that she created the term/field "financial social work" in the 1990s). "Social workers have always helped people in financial distress access community resources and public benefits, and advocated for more economically just public policies," says Mat Despard, PhD, MSW, an assistant professor at the University of Michigan School of Social Work. "What makes financial social work different is the recognition that financial insecurity isn't just a lack of sufficient income. It's not having enough saved for emergencies like a major repair, drowning in credit card debt, or being unable to find a decent apartment to rent because of damaged credit. "Financial social work is comprised of the efforts of social workers—through direct, community, and policy practice—to promote financial security among individuals and families," he continues. "It's about integrating a focus on personal and household financial well-being into social work practice." As with all subsets of social work, financial social work is a layered area of the field. "The terms are still being worked out," says Julie Birkenmaier, PhD, MSW, LCSW, a professor at the Saint Louis University School of Social Work. "'Financial social work' is used because it's a short way of describing this area of practice." Three key terms used in the area are income sufficiency, asset building, and financial capability. "Sometimes people think about income sufficiency as really just focusing on budgeting and helping clients figure out how to balance income and expenses," Birkenmaier says. "But this area of work is also focusing on trying to help clients better their economic lives through income generation. This is about exploring education and training. It's exploring workforce development programs. [It's about] thinking about ways to capture, as a household, more resources." "Asset building and financial capability are newer areas of interest for social workers, although many social workers practice in these areas," Sherraden adds. "Assets are the financial and tangible resources that people own that provide people with a financial cushion and enable them to invest in developmental opportunities over their lifetimes, such as education, a small business, a house, and retirement. "The idea of financial capability is inspired by social work's person-in-environment perspective," she continues, "and is a person's ability to act and opportunity to act in his/her best financial interests. This means having the financial knowledge and skills to manage and oversee one's finances but also having access to the real opportunities that make financial well-being possible." These three areas combined promote financial well-being. To understand the need for social workers to be well versed in financial well-being, it must first be made clear why clients may need assistance. As previously mentioned, there is a disconnect between individuals and their finances—a glaring one. "Forty percent of Americans are financially illiterate," Wolfsohn says. "Therein lies your problem. You cycle right back to the fact that we don't teach [finances] in our schools, so how in the world is that [statistic] going to improve? "One in five Americans expect to take their debt to the grave," she continues. "Forty-six percent of families say that they would struggle to meet an emergency expense of $400. There are a lot of things working against people," she says. Despard explains how financial insecurity affects many other problems about which social workers care. "First, financial stress and insecurity are associated with a host of bad outcomes: disrupted parenting practices, academic and behavioral problems among children, health and mental health problems, and stunted brain development in early childhood, to name a few," he says. "Second," he continues, "financial insecurity makes it a lot harder for clients to achieve their goals. People who have experienced intimate partner violence need economic freedom from their abusers. Youth exiting foster care who are financially insecure will find it difficult to navigate successful transitions to young adulthood," he offers by way of example. Despard adds that economic inequality is worsening and that the "social safety net," which includes programs like the Supplemental Nutrition Assistance Program (known as SNAP) and housing subsidies, is weakening. Birkenmaier agrees: "So many families are still recovering from the Great Recession in the communities where we do a lot of our work. Families are struggling with wage stagnation, underemployment, and unemployment. Families are working harder and harder," she says. "As these broader economic trends are impacting our clients, there are more needs. It's more obvious that the roots of some of the problems [our clients face] are in fact financial." With that in mind, it is necessary that social work students be educated about finances and their intersection with social work from the start of their college or postgraduate careers. "They [students] will be working regularly with individuals and families in financial distress, and until we have political leadership in this country that meaningfully addresses economic inequality, things are only going to get worse," Despard says. "Just like a physician needs the knowledge and skills to address physical distress, social workers need the knowledge and skills to address financial distress in any field of practice." It will also help them as social workers—both personally and professionally. "Social workers also need to understand these issues to protect themselves and their families. Social work students are also affected by growing student debt, so they need to understand their repayment options and access loan forgiveness programs. If they want to buy a car or a home, they need to understand loan terms and how important it is to have good credit to access favorable interest rates," Despard adds. 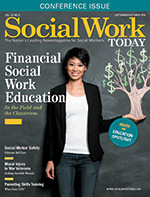 Gabrielle D. agrees, stating that educating social work students on finances may help keep more social workers in the field. "Everyone who has worked at a nonprofit organization understands that there are some fiscal realities that do not allow for a comfortable living situation. The goal would be to reduce the risk that you lose passionate and smart and hopeful professionals from those fields and roles and positions because of those financial realities. One of the things you can do is prepare them," she says. "It's a lot different being caught off guard by these financial realities than it is to have a plan." Unfortunately, the current reality is that many students are caught off guard. "Social workers have the beginnings of the competencies they need," Birkenmaier says. "But do they have the skills they need? Not yet. We are actively trying to change that. There is still a lot of work to do to be prepared for the practice context. I think a lot of social workers do work with family finances, but they learn about that in practice, not in academia. It's a missed opportunity. "We need to prepare them to not just work on what's right in front of them but also to have a more broad knowledge of what is going on in the economy and what families are bringing to them in their history." The good news is there is work being done to bring financial social work to the classroom. "I teach a course on this topic at the undergraduate and graduate level," Birkenmaier says. "Students who are financially independent … talk about the idea that it's helpful for them personally. A lot of them [the students] come from the same context as clients do. They may not have had access to formal financial education in the past." Birkenmaier and Sherraden are also a part of a team creating a foundation curriculum. "The foundation curriculum tries to provide students with this broad understanding of a person and their environment," Sherraden says, "which I think is one of the strengths of our profession." "We have been piloting it at various universities for a couple of years," Birkenmaier adds. "The interest has really grown. Upwards of 20 different schools are using parts of that curriculum within their courses. So I think there's reason to be hopeful." Another reason to be hopeful is that the Council on Social Work Education has announced its commitment to ensuring that the concept of economic well-being and an economic-informed perspective become a part of social work curriculums. The primary goal in these efforts is curriculum integration. "Our goal is not to promote financial social work practice as a separate focus," Sherraden says. "In fact, we hope that financial social work is integrated into all areas of social work practice, across the curriculum. In social work, we have people who specialize, but one would hope that every social worker would have a background in domestic violence, mental health, and financial issues. That's what we're aiming for," she says, "to kind of up the level of knowledge and understanding. "That said," Sherraden adds, "there are students who are particularly interested in financial issues from a social work perspective, and these students may want to have the option for specialization of some kind." The University of Maryland School of Social Work has also launched a Financial Social Work Initiative aimed at integrating financial social work into the practice and education of social workers. Through classwork, internships, research, and the development of a professional network, the initiative hopes to advance the field. As the education within social work classrooms continues, it does so externally as well. Wolfsohn is a big part of that. She has created, through the Center of Financial Social Work, a certification for professionals. The certification has been approved by NASW for 20 CEUs. It is designed to be completed at the student's pace. "Our students have six months to complete it and then two weeks to complete the exam," Wolfsohn says. "There are five workbooks. Each one is on, more or less, a specific topic, and they all have a financial component and a psychosocial component. They're all very interactive and introspective so that our students go through the process personally. "We're not telling them, 'This is what you do with your clients.' We're having them experience that. I think it makes all the difference. I need to know that people who go through the certification have a better chance to create financial wellbeing for themselves," she adds. Wolfsohn's version of financial social work focuses on financial behavioral change using a psychosocial approach. The idea is to empower social workers to use the skills and tools they already possess to help themselves and their clients. Wolfsohn's curriculum has been taught at the University of Kentucky, and she presents regularly to professors and practitioners not only in the United States but also throughout the world. Gabrielle D. is also actively working to spread financial social work throughout the field. "I do more social work now than I was able to as a social worker," she says. She sits on the board of several financially focused social impact organizations and, separately, offers webinars and other training on financial literacy. "I do a four-part series on the intersection of money and social work," she says by way of example. "One of the points that I make is that financial literacy and stability is socially inherited. If your parents or friends or colleagues talk about it and support you in certain practices, then you inherit that. But if nobody talks to you [about finances], you aren't going to be making the best decisions." And the best decisions are informed decisions, not only for clients but for social workers and social work students as well. "It's not an easy fix," Wolfsohn says of financial well-being. "But it's very real and very present in all of the work that social workers do." After all, "The only two things we are sure of," she concludes, "are taxes and death." — Sue Coyle, MSW, is a freelance writer and social worker in the Philadelphia suburbs and a frequent contributor to Social Work Today.